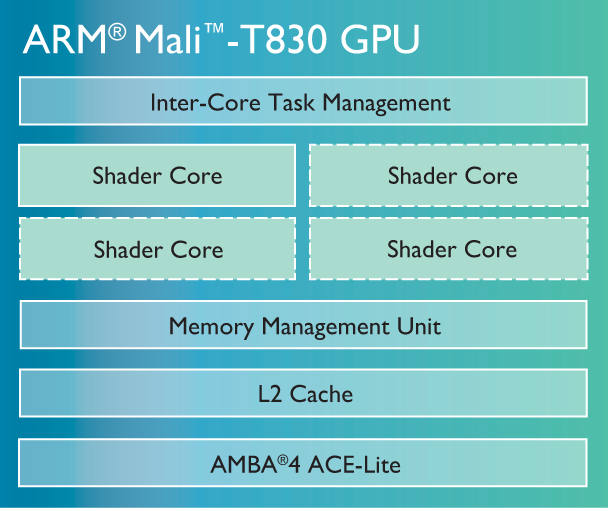 The ARM Mali-T830 MP2 is an integrated graphics card for smartphones and tablets. It first appeared in the HiSilicon Kirin 650 in the beginning of 2016. The chip features two clusters and supports OpenGL ES 3.2, OpenCL 1.2 and DirectX 11 (FL 9_3). The performance should be similar to the old ARM Mali-450 MP4 and therefore non demanding Android games should run fluently. The ARM Mali-T830 MP2 in the Kirin 650 is manufactured at TSMC at 16nm FF+ and therefore also suited for smaller smartphones.